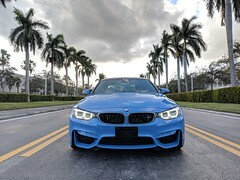 BMW today announced a new M Performance exhaust system specifically designed as an accessory for the BMW M3 Coupe, Sedan and Convertible. lol wow that allot of money for a exhaust . $4300 is an expensive exhaust. Did you even look on google? There are quite a few good supercharger and turbo kits available for the e9x m3.. I am going to make a bold claim, that the f30 is this millenium's e30...... god needed a new chariot, he decided to upgrade to something thats not falling apart and making farting noises down the street having satan laughing at him. Idiocracy was supposed to be cautionary tale, not a prophecy. There's no turbo e9x yet. If you haven't found a SC kit yet, you need to start using google. Vorsteiner is probably one of the crappiest exhaust out there. If you were to put an emphasis on quality, akrapovic would definitely be at the top of the list.